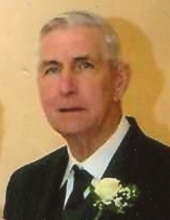 Celebrating the life of Thomas F. Ryan, Jr.
Obituary for Thomas F. Ryan, Jr.
Thomas F. Ryan, Jr., age 81, passed away peacefully on January 23, 2019. He was the son of the late Thomas F. Sr. and Sophie (Gnoza) Ryan. Born June 17, 1937 in Boston, he attended Boston Public Schools. He was employed for many years as a custodian at the Igo and Taylor Elementary Schools in Foxborough. He married his wife and best friend Carol (Gaeta) on February 20, 1965 in Rhode Island. He was an avid Boston sports fan and enjoyed listening to country western music. He also enjoyed long car rides to New Hampshire and Cape Cod. He was a loving and devoted husband and father who enjoyed spending time with his family. In addition to his wife, he is survived by his children Thomas F. Ryan, III and his wife Annmarie and Dawn Ryan all of Foxborough. He was the brother of the late Mary McCarthy, Peter Ryan, Francis Ryan, William Ryan, Kathleen Lallis and Joanne Lightbody. Relatives and friends are kindly invited to attend a calling hour at 10:00 AM on Tuesday, January 29 at the Roberts and Sons Funeral Home, 30 South Street, Foxborough. A funeral service will follow at 11:00 AM at the funeral home. Interment to follow at St. Mary’s Cemetery, Foxborough. For additional information please contact 508- 543-5471. To send an on-line condolence please visit the funeral home web site at www.robertsandsonsfuneralhome.com. In lieu of flowers, donations in Tom’s memory may be made to the American Lung Association, 1661 Worcester Rd., Suite 301, Framingham, MA 01701 or the Foxboro Discretionary Fund, PO Box 636, Foxborough, MA 02035. "Email Address" would like to share the life celebration of Thomas F. Ryan, Jr.. Click on the "link" to go to share a favorite memory or leave a condolence message for the family.